Home Truths was the first collection that caught my reader’s eye. But I picked and chose. Read the Selected Stories instead of the original collections. Read from anthologies. I have not been a loyal Mavis Gallant reader. Now, having deliberately and carefully read through this collection, I can’t explain why. I should have been. Right from the start. Her preoccupations as a writer are my preoccupations as a reader: it’s a perfect match. Take “In the Tunnel”, a 35-page-long story which opens with Sarah Holmes and a consideration of her relationship with her widowed father, the larger portion of the story being, however, concerned with a relationship that she has whilst travelling, in the Mediterranean. Sarah is in the position of being able to experiment with her identity in a way that wouldn’t have been possible if she’d been under the watchful eye of her father. The language is sometimes poetic, but not cluttered. Mr Reeve might look “oddly starched, like a nurse coming on duty”. The sofa might be “the colour of Teddy-bear stuffing”. One of the reasons that I’ve chosen to chat about this story in particular is the variety of relationships considered therein. There is Sarah’s relationship with her lover, that with her father, the relationship between the Reeves and their niece, and the marriage of the Reeves themselves: there is a lot to watch. This is the kind of story that you know, even on first acquaintance, that you will be able to re-read several times, always discovering another nuance, another layer. It’s a conversation that Sarah is having with one person in particular, but the movements described are primarily internal and examining the intricacies of them is at the heart of several of the stories in this collection. As is the running conversation of an individual with their inner identity, often shifting, sometimes deliberately and sometimes fluidly. These are very quiet and very busy stories. I had a lot of trouble balancing my need to leave a fair bit of time between these stories and the need to finish reading them with Canada Reads Independently in mind; I think they would have stuck more firmly and clearly if I’d left even more time between. In each story, there’s a lot to take in; I can see where you might have trouble remembering after much time had passed! 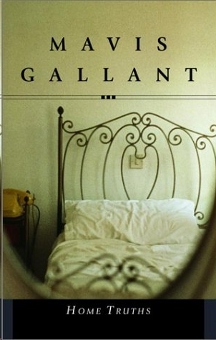 I read the NYRB collection of Gallant work, Paris Stories, and I enjoyed it quite a lot, although I can’t remember any of the details! Some books are just like that — good, but the details don’t stick.